Paula and Fred are nun and monk of the Kosen Sangha. We do the summer camp in july august, in the zen temple Yujo Nyusanji, South of France. You can check the list of sesshin with the kosen sangha here. In Göteborg, you can also practice in the Sanbo dojo, where we used to sit regularly. 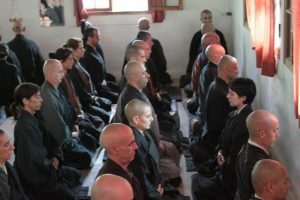 They practice longer zazen (45mm to one hour), and during sesshin, non-stop zazen-kinhin for many hours, in the tradition of Master Kodo Sawaki. We tend to do 30-35 minutes zazen, (sometimes longer), and sesshin with 5 to 6 hours in the dojo, in four periods of two zazen with one kin-hin in between. We follow the spirit of Kodo’s disciple Master Taisen Deshimaru, as transmited through his disciple, master Kosen , which is to make accessible zazen practice to westeners, people having busy life, with work and children. This is also the continuation of Master Kodo Sawaki , who is well known for having opened zazen practice to layman.